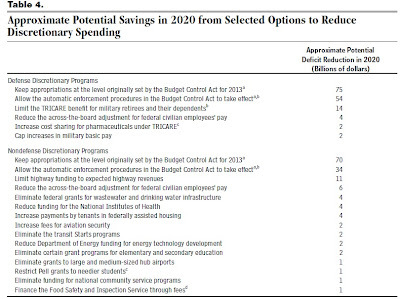 The Congressional Budget Office has just published a report called "Choices for Deficit Reduction." To me, the bottom line is that coming to grips with the U.S. fiscal situation in the medium run is going to require going outside everyone's current comfort zone. That provisions of the Budget Control Act of 2011that established automatic enforcement procedures designed to reduce discretionary and mandatory spending beginning in January 2013 do not go into effect, although the law’s original caps on discretionary appropriations remain in place." 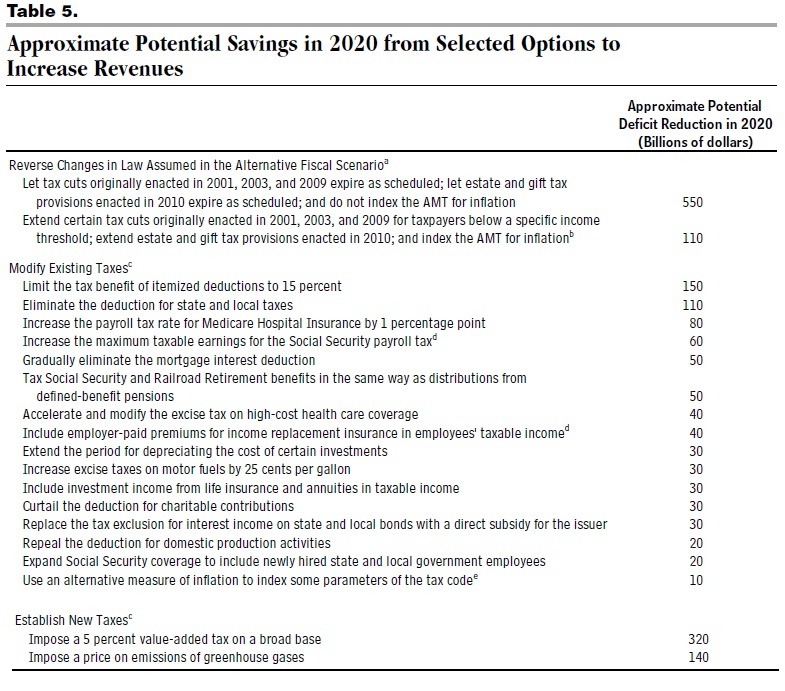 As one way of getting a handle on what needs to be done, the CBO looks at a variety of possible spending and tax policies, and how they would affect the budget deficit that in the alternative fiscal scenario would be about $1 trillion in 2020. Thus, steps that reduce the projected 2020 deficit by $1 trillion would balance the budget, and get the debt/GDP ratio on a declining path. Steps that reduce the projected 2020 deficit by $500 billion would keep the debt/GDP ratio in 2020 about the same as it is now--but the debt/GDP ratio would start rising after that point. An intermediate set of policies that reduce the 2020 deficit by $750 billion would put the long-term trend of the debt/GDP ratio on a slightly declining path--more-or-less what the baseline scenario looks like. So what do the possible policy options look like? 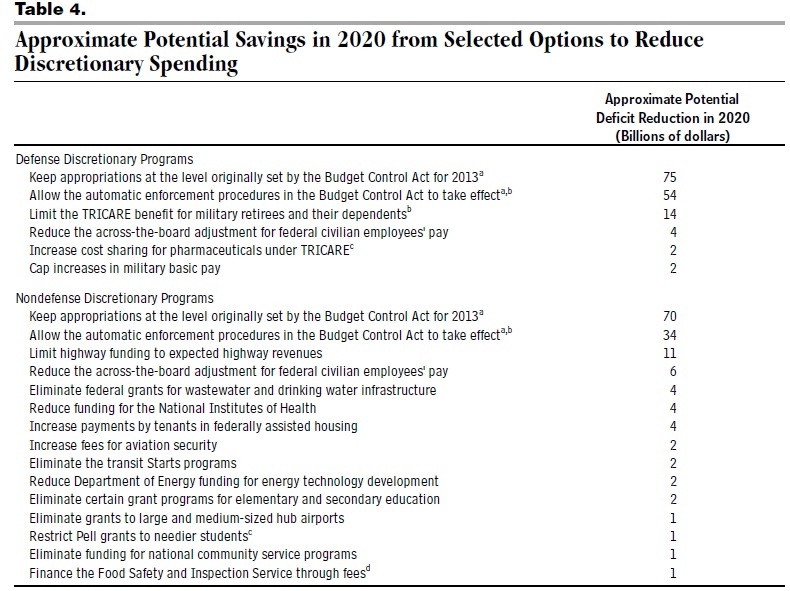 They come in three tables: possibilities for reducing mandatory spending, possibilities for reducing discretionary spending, and possibilities for increasing taxes. You'll notice that many of the recommendations come with various footnotes and caveats, which in turn require heading for the actual report. 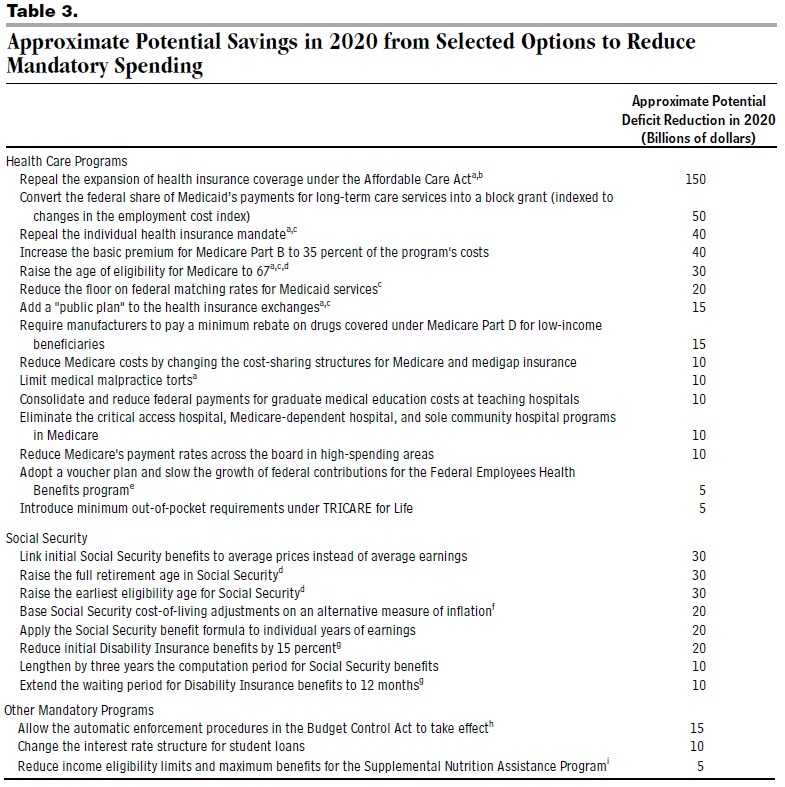 Some of the recommendations overlap in various ways (like different methods of altering Social Security or Medicare), and so you can't just add up all the choices. But for a quick sense of the issue, just glance at the right-hand numbers showing the total projected change in the deficit. 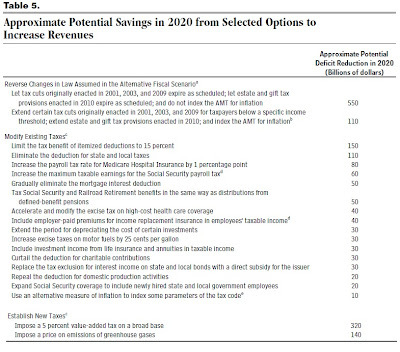 If you take the intermediate goal of cutting the projected 2020 deficit by $750 billion, most people will very quickly run out of easily palatable options. For example, repealing the expansion of health insurance coverage and the "individual mandate" to buy health insurance from the Affordable Care Act would reduce the 2020 deficit by about $190 billion, which is real money, but not nearly enough (and would leave tens of millions of Americans again without health insurance). Or letting the the tax cuts enacted in 2001, 2003, and 2009 expire only for couples filing joint tax returns with income over $250,000 per year and for single taxpayers with income over $200,000, along with indexing the alternative minimum tax (AMT) for inflation, reduced the 2020 deficit by $110 billion, which is real money, but not nearly enough to do what is needed. 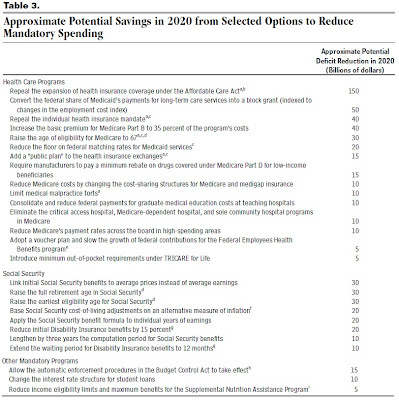 So even if Republicans and Democrats would compromise on eliminating Obama's health care plan in exchange for eliminating the Bush tax cuts for those above $200,000 or $250,000 per year, they would have less than half of the $750 billion deficit reduction. To put it another way, Americans and U.S. economy are more drunk on deficit spending, and withdrawal is going to be more painful than most people realize. Why Doesn't Someone Undercut Payday Lending? The Paperless Office: Headed that Way at Last? Minimum Wage to $9.50? $9.80? $10? 72 is the New 30?! !